Yesterday’s decline was definitely muted, lasting less than one day on the downside. Today the DJ Industrials made a new high above the April 2nd peak. This was an unconfirmed new high as no other index made a new high today. That’s not a comforting fact but we’ll see what unfolds in the days ahead. All but one of the junk bond ETFs that I follow made a new high today. It’s always good to see junk bonds leading the way higher as they are the economic “canary in the coal mine”. As you will see in the following charts there is a disagreement between the short term and longer term (daily) wave count. In the first chart, it appears that we have ended step 3 up counting from April 23rd. An interesting point is that the daily wave count doesn’t agree with this chart. The daily chart says that we have begun step 2 up since 4/23. This difference will be resolved and if the market advances, the daily chart will likely win the argument. Looking at the picture since the April 10th bottom, we see that we are in a larger second step up. This wave count agrees with the daily chart. Looking at the daily chart, it shows that we are in the 2nd step up since the April 10th bottom, and 2nd step up since April 23rd. I’ve been a follower of Terry Laundry since the 1970s. I like guys with new ideas and in the 1970s he had an idea about matched time intervals. He called it the “Magic T Theory” but later he changed the name to “T Theory”. But it did seem magical to me in the beginning. Terry’s idea was that the time interval from a peak (or bottom) to the reversal date will be equal to the time interval after the reversal date to its mirrored bottom (or peak). I had occasionally observed the same phenomena but I couldn’t make it work consistently and abandoned the idea. Since Terry solved the relationship problem, I knew I had to follow his forecasts. Terry’s a very smart guy (graduate of MIT). Recently Terry has developed a new T indicator based on price and it looks promising. The following analysis has its hazards because it violates Terry’s standard rules. Terry’s prior T construction weren’t based on price (volume, advance-decline, etc), while the new T indicator is based only on price. With that, I’m wondering if the “rules” might be different. Beware, the warning is that it can be hazardous to your economic health to violate a master’s method (Terry’s method). Plunging ahead. In the following charts the thick line is the beginning of the T, the dotted line is the center post of the T, the thin line is the end of the T. I have also added arrows indicating beginning and ending dates for the Ts when there is more than one T at the beginning date. For those who don’t follow Terry’s methods, the end of the T (right side) is the predicted termination point for the bull move. Ts usually range in length from a few months to years. 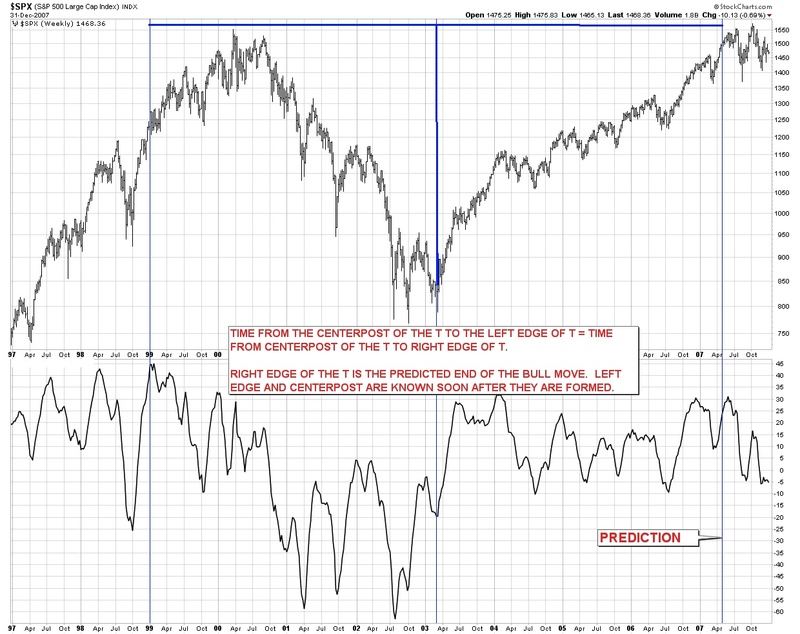 The center post of the T is “in the neighborhood” of the reversal date. The following chart is an illustration of the T.
Following are a couple of charts with my interpretation of the present Ts based on Terry’s new indicator. Terry shows the T ending on the April 2nd peak (good call). In my interpretation, I’m giving a longer life to the T. We’ll see how this works in the days and weeks ahead, but there is a Hurst cyclic timing angle to my T dates that could make this interesting. Crash and burn is certainly possible when trying a T idea that Terry hasn’t advocated. The first chart is the weekly SPX chart showing the SP 500 since 2006. It shows the T that was formed during that period and the end of the T at the May 2011 peak. 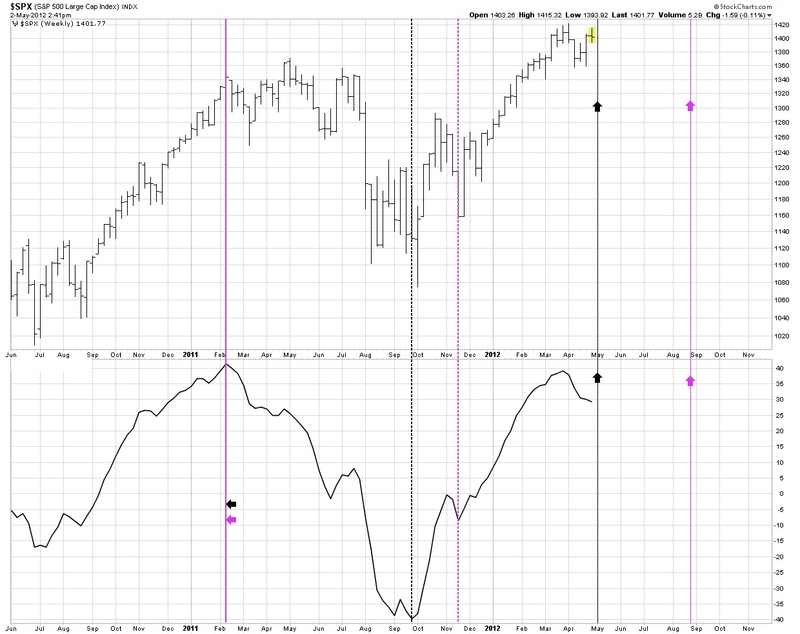 The next chart is also a weekly SPX chart and it has a T (black) ending next week. I also show another T ending in late August 2012 (purple). These two T dates differ only because of a different placement of the center post of the same T.
The second chart is the daily SPX chart. I have modified the T indicator for the daily chart. Whether this modification is correct is debatable but we’ll find out later. In the daily chart, the first T is shown ending in late May (purple). The second T ends in early September (black). These two T dates differ only because of a different placement of the center post of the same T.
My weekly T show an ending date next week (May 7-11) and late August. The daily Ts show an ending date in late May and early September. Both the daily and weekly T dates are in the “ballpark” of each other. It was hoped that the daily chart could fine tune the T’s ending date, but I’m skeptical on the fine tuning. Wait and see is the buzz-word. The wave count (if correct) “could” accommodate these T dates. Reading the Hurst cyclic dates below shows that they “could” also accommodate these T dates. “The first chart shows the period, September 2011 to February 2013. 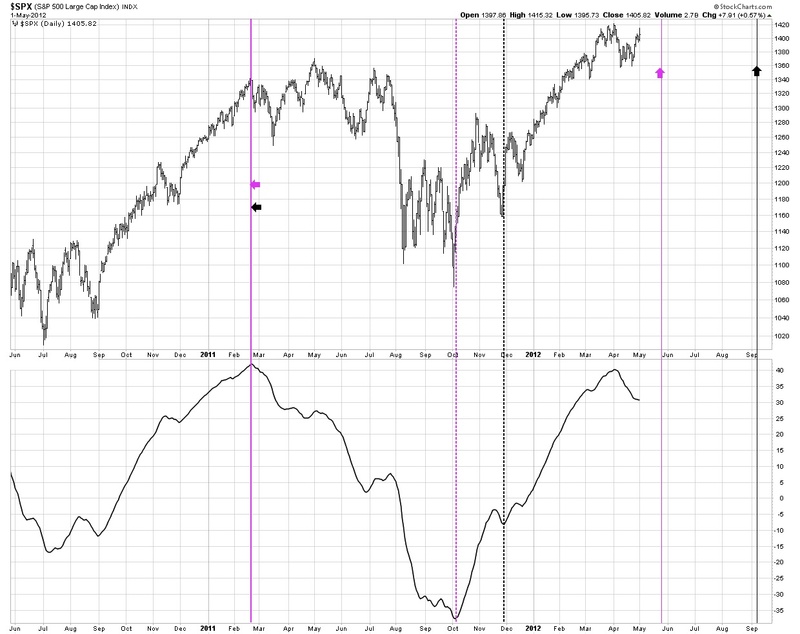 There was a cycle bottoming from late March to the first week of April 2012. It’s safe to say that the April 10, 2012 bottom was that predicted cycle bottom. The next cycle of importance is expected around June 2012. As we approach that date, the wave count plus the Hurst cyclic data should fine tune the expected date range. Whether the June 2012 bottom is the end of the correction that began on April 2, 2012 can’t be answered at this time. The above Hurst charts were published on April 22 and the next day (4/23) proved to be an important turn date. In addition, it was unknown on 4/22 the importance of the April 10th reversal date. These turn dates have definitely affected the outcome of the next Hurst cycle date. I will run the Hurst software soon and publish the results. An “approximate” July 2012 cyclic bottom could work for an intermediate term peak occurring in May (blue 2, chart #10.6). An important cycle bottom is also predicted for November 2012 to January 2013, which could work for a late August, early September peak. A September peak could indicate an ending of blue 3, which “could” be the end of the bull market dating from March 2009. A blue 3 termination would be a definite major sell point. September 2012 could also mark the end of only the first step up in Large step #3 (black 3 in chart #10.8). On the flip side, January 2013 could mark first step down in the following bear market (horrors). All these answers and more provided at a later date, stay tuned for late breaking events (it’s May sweeps). 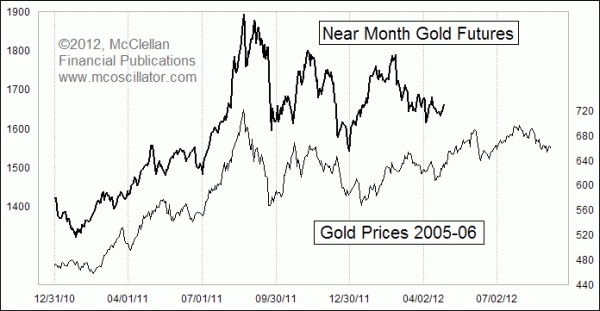 McClellan published an interesting chart recently that shows a relationship between the movement of gold during 2005 and the present. Chart #40.3 in MY CHARTS shows a possible wave count for gold, which if correct means gold could move upward soon. As McClellan points out, gold has a strong positive correlationship to stocks and a strong negative corelationship to the US Dollar. In order for gold to advance from this point, stocks must advance and if the dollar goes down, this will likely take place. A big thank you to Terry Laundry and Parker for developing a new T indicator. One of the differences between this indicator and others that Terry has developed is that it’s solely dependent on price and not an internal indicator. I’m a big fan of price indicators as price RULES. For me, internal structure is used to “confirm” the price movements. On occasion internals may not confirm price, and in hindsight, price was correct and the internals were lacking. I remember the period after the October 1962 bottom (missiles of October, scary time) and the subsequent 1965 price peak. During this period the daily advance decline line wasn’t working properly. The market was methodically and steadily forging ahead but the daily AD line was not confirming. Somebody decided to look at the weekly advance decline line and viola . . . confirmation of the price action. Just an example of how internals may say one thing while price is saying another. We all know that price has the last word. I’m going to look at past structure on this indicator outside of StockCharts as their history only goes back to 1981. I have the SP 500 daily prices from 1951 and daily DJ Industrials since 1896. I think that’s adequate for the mission. All I have to do is find the time to do it. This entry was posted on May 1, 2012 at 10:59 PM and is filed under IN DEPTH, UPDATE. You can subscribe via RSS 2.0 feed to this post's comments. You can comment below, or link to this permanent URL from your own site. Just updated the blog, which should answer your questions. Bob whats your thoughts on today’s sell- off -are you still long? Can see the validity in your second bottom – as you said these T’s could have a different rule book. 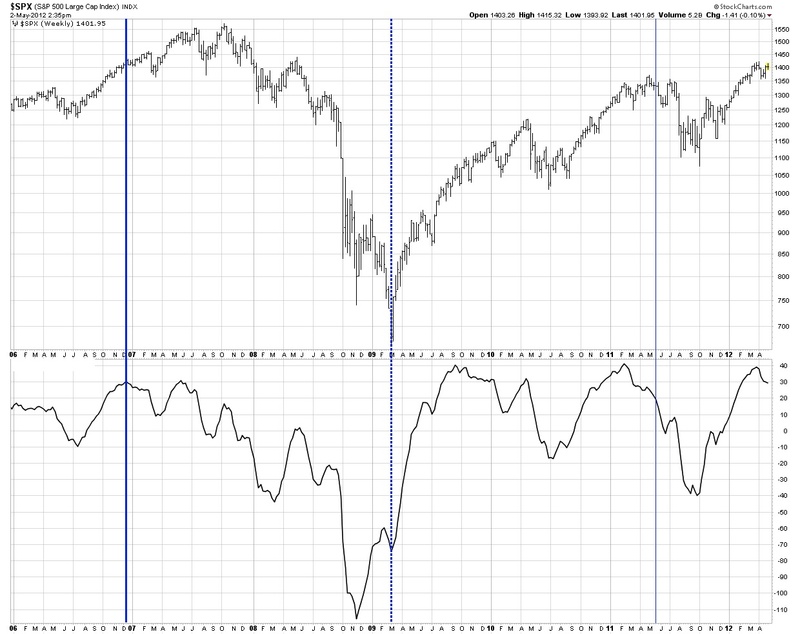 I have been playing with the confidence indicator and have a mid May date for end. Again I havent looked back very far so not sure of history. The placement of the November T center post is the point where the down sloping line was broken to the upside. As I said, I kinda tossed the rules away because this T construction is based on price alone instead of internal indicators and “could” have a different rule book. Maybe that won’t be the case, but for now it’s just a stab in the dark idea. Terry is using different numbers in his new T construction. I’m sure he or Parker will reveal the numbers in due course. I was working on yesterday’s update almost all day and finally published at 11 PM (my time). I was struggling with the idea that my outlook was changing (it didn’t). But when I finally published I was very tired. This morning I found that I had made a T charting mistake. No surprise there, when I’m tired I make mistakes. I have corrected the mistake. I noticed that using the price high worked for an eariler T. Quickly looking back it looks mixed, but I need to have a decent study. One thing I dont understand, was why you used late Nov 2011 as a center post as this doesnt fit with any normal T rules to my knowledge? Just as an aside – May 15 does have some Astro significance – not that I am at all knowledge in this area.